Benchmark’s TC9639 Thermal Cycler provides consistent, reliable results for laboratories with medium to high throughput. From its large, touch-screen user interface to its unique, multi-format block, this cycler is loaded with features. The program wizard and 10 preinstalled programs make it easier than ever to get up and running. A large, full color touch screen serves as the operations center where all functions are accessed. From the “Home” screen, simply touch an icon to view the last run program, enter the program library, or use the program wizard to quickly enter a protocol. In addition, icons for favorite programs can be added for faster access. The program wizard guides users through quickly setting up a protocol in a single screen. Once entered, programs are shown graphically, and can be edited by simply touching the step that requires modification. Time and temperature increments can be built into programs as well as slower ramp rates. Storage capabilities are unlimited; programs can be stored in public folders, private (password protected) folders or on a flash drive. The full virtual keyboard allows for alphanumeric naming of programs and folders. The fully adjustable heated lid prevents condensation and evaporation of samples. 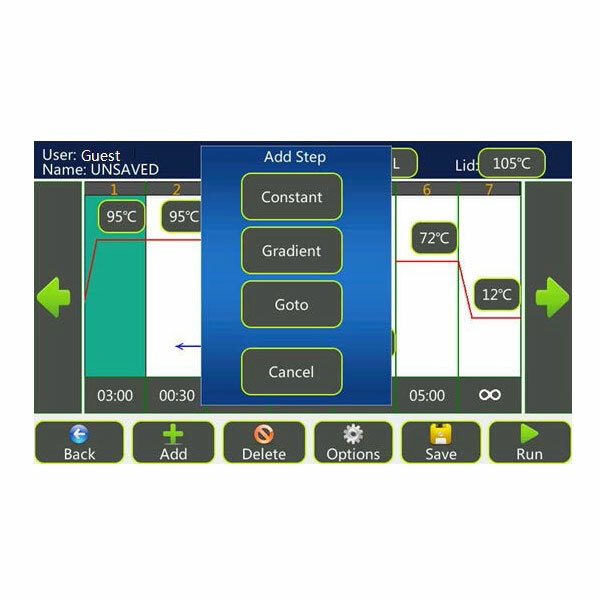 Lid temperature can be programmed, and when the block temperature is below 35°, the lid automatically shuts off. Heating and cooling of the block are precisely and accurately controlled within exceptionally tight tolerances by a proprietary algorithm that simulates sample temperature. With the multi-format block, there is no need for the expense of multiple interchangeable blocks. The TC 9639 has the flexibility to accept 96×0.2ml tubes, a 96 well plate, 0.2ml strips or 39 x 0.5ml tubes all in the same sample block. For protocol optimization, a gradient can be set up across the block. An optional in-situ adapter allows for incubation of slides. Additionally, the unit may be purchased with a 384 well sample block. Compatible with Accuris™ PCR reagents, click here for more information.